It was revenge two years in the making Saturday afternoon when USD beat No. 11 ranked University of Northern Iowa 28-25 in a close Dakota Days game in the DakotaDome. 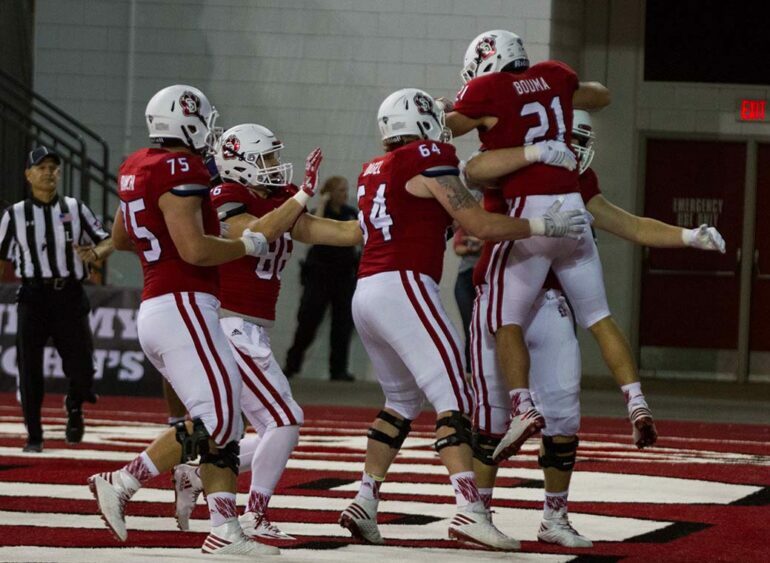 The Coyotes came out of the gate early with a huge 69-yard rushing touchdown by USD quarterback Chris Streveler in the first two minutes of the game, setting the tone for the game that was much different than when USD was beat 27-16 by UNI two years ago on Dakota Days. The UNI Panthers were quick to respond though, getting a touchdown of their own after a short series took them up the field and a short pass put them in the end zone. Responding back and forth to scores was the name of the game for the two teams, with both the Panthers and Coyotes trading touchdowns throughout the first half. At half USD led 21-17. In the second half, the Coyotes held out against the Panthers with a strong defense shutting down UNI’s passing offense. A missed 37-yard field goal by UNI late in the fourth quarter would give USD the win. Sophomore wide receiver Tacari Carpenter said even with the big win over UNI, the Coyotes are looking to improve. For senior defensive lineman Colin Mertlik, the win over UNI on D-Days was a special occasion, but he said USD won’t let the win go to their heads and will continue to work on improving for future games. With the win, the Coyote advance 2-4 on the season and will take on Indiana State next Saturday in Indiana.